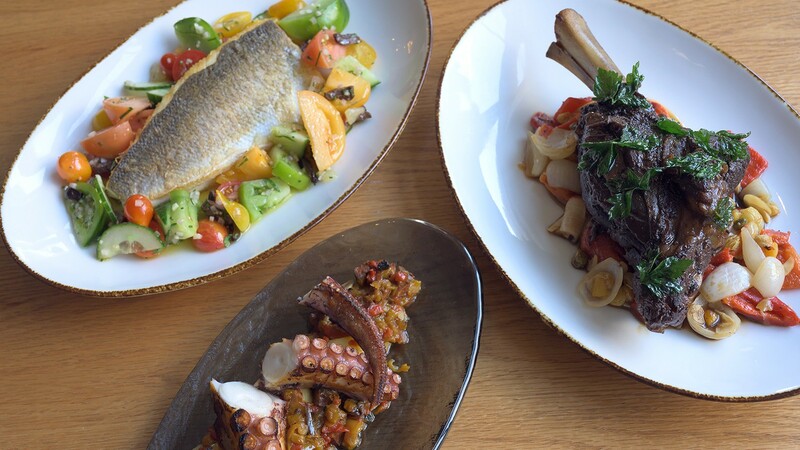 The loup de mer (left), the grilled octopus, and the Persian-style lamb. Many new eateries in the East Bay focus narrowly on regional delights, like Xi'an style street food, Oaxacan cuisine, or even a single dish like Taiwanese beef noodle soup. But ZINO, the new restaurant that opened in Berkeley's Hotel Shattuck Plaza in July, serves a broad variety of cuisine from all over the Mediterranean. ZINO's executive chef, Brandon Hicks, earned his chops in Mediterranean cooking as the chef de cuisine at well-regarded Lebanese-Mediterranean restaurant ilili in New York City. The owners of Hotel Shattuck Plaza, BPR Hospitality, wanted to refresh the hotel's former Southern-influenced restaurant, FIVE, and transform it into a pan-Mediterranean restaurant serving breakfast, lunch, dinner, and brunch with Hicks's guidance. "Instead of pigeonholing themselves as French, Mediterranean, Lebanese, or Eastern Mediterranean, they wanted to take full advantage of all 22 countries throughout the Mediterranean," Hicks said. With such a broad palette of flavors, the restaurant can appeal to a variety of tastes. That's also true for hotel guests who aren't necessarily seeking an exciting dining experience. "Being a hotel restaurant, we have clients who are not necessarily looking for Mediterranean food. They want just a classic burger, or something really simple, and they might be here... for a meeting. We're conscious of that." Still, the dinner menu leans toward more sophisticated choices. For starters, the knowledgeable server recommended the pita bread with housemade dips. The baba ghanouj carried a pleasant aroma of smokiness, created by roasting the eggplants over the grill, then peeling the charred skins. The muhamarra was made with a blend of comforting, autumnal ingredients like tahini, cumin, pomegranate, piquillo peppers, and walnuts. However, the dip was dry, making it hard to scoop up with the pita. The lackluster muhamarra was forgiven when the star of ZINO's menu arrived: grilled octopus, served with dried Spanish chorizo and potatoes on a rippled blue glass plate evocative of the ocean. The Galician octopus tentacles were seared in olive oil to form a delicate crust on the outside, while the meat remained succulent inside. Capers, chorizo, and Moroccan olives provided plenty of salty contrast, balanced by the fingerling potatoes, while onions and peppers lent sweet yet acidic counterpoints. In a way, the octopus is representative of ZINO's concept and potential. While the dish remains fairly true to its Spanish roots, Hicks adds a Moroccan touch with the olives, and sears the octopus in local California olive oil. While some ingredients are imported from the Mediterranean, Hicks prefers local ingredients when possible. "It didn't seem right importing from half a world away when there's very good versions here in California." One fish entrée, the loup de mer, espoused a similar concept. The fish (also known as European sea bass or branzino) is imported from Turkey, flanked by local heirloom tomatoes and cucumbers wilted in warm California olive oil. The fish was served filleted, with crisp skin flecked with grains of sea salt, and the tender flesh inside was cooked just right. A Southern French-style sauce vierge, made with lemon, olive oil, and fresh tomatoes, attempted to tie the dish together — but since the tomatoes were cut so large, they felt more like a side salad than a dressing for the fish. The Italian-inspired calamari a la plancha dish used strozzapreti pasta with a nice rough texture that picked up the bagna cauda sauce, made with anchovies, olive oil, and garlic. But the heirloom tomatoes, capers, Moroccan olives, and basil felt more like toppings added to the pasta at the last minute, rather than part of a cohesive sauce. And while the squid was cooked just right, the decision to include only the squid bodies and not the legs meant a missed opportunity for added texture. The Persian-style lamb shoulder was enjoyable, and spices like cinnamon along with golden raisins and dried apricots brightened the dish — but at $27, it could have used an accompanying starch to round out the dish and contrast the richness of the lamb. A simple and inexpensive side dish of fresh snap peas could have been treated as an afterthought, but instead was one of the menu's highlights. The peas were crunchy and well-seasoned and served in a frothy mixture of yogurt and Lebanese toum, an emulsion of garlic and olive oil. Hicks said the peas will be taken off the menu once they're out of season. But if ZINO can continue its strong execution of fresh seasonal vegetables, that should resonate with a Berkeley audience. Drinks and dessert here are also well-thought out. Caleb Kimbley of San Francisco cocktail bar Forgery created the cocktail menu with ingredients designed to complement ZINO's Mediterranean cuisine. The Opposite Shore cocktail is a refreshing and mildly sweet mix of Tanqueray 10 gin, Giffard pamplemousse, sumac, za'atar, and basil oil. There's also a small but intriguing selection of wine and beer, both local and Mediterranean. And the kanafe, a dessert of warm cheese encrusted with crushed phyllo dough, is an unusual salty-sweet option. It's made with locally produced Laura Chenel goat cheese rather than the traditional, stretchy cow's milk cheese, and local apricots rather than the traditional rose water. But there was a slight hiccup with dessert service — the dessert took a long time to come out, and it was hard to flag down a server for an extra plate for sharing. Dinner, while imperfect, was enjoyable and showed potential. The brunch, however, needs improvement. The shakshuka — eggs baked in a tomato and pepper sauce and topped with feta cheese — had a flavorful sauce, but the eggs were overcooked, with yolks that crumbled at the edges. The cured salmon, which was supposed to be served on a sesame-encrusted, Greek-style koulouri bagel, instead came on a plain, doughy bagel. The bagel's saving grace was the labneh, a tangy strained yogurt sauce served in place of cream cheese, which provided a unique Middle Eastern twist. Hours: Breakfast Mon.-Fri. 6:30 a.m.-10:30 a.m.; lunch Mon.-Fri. 11:30 a.m.-1:30 p.m.; dinner Sun.-Wed. 5 p.m.-9 p.m., Thur.-Sat. 5 p.m.-10 p.m.; brunch Sat.-Sun. 7 a.m.-1:30 p.m.